Timeless Talk Penny Farthing using up bits and pieces. Just using up some scraps on my desktop. I am quite pleased with how this vintage look came together. 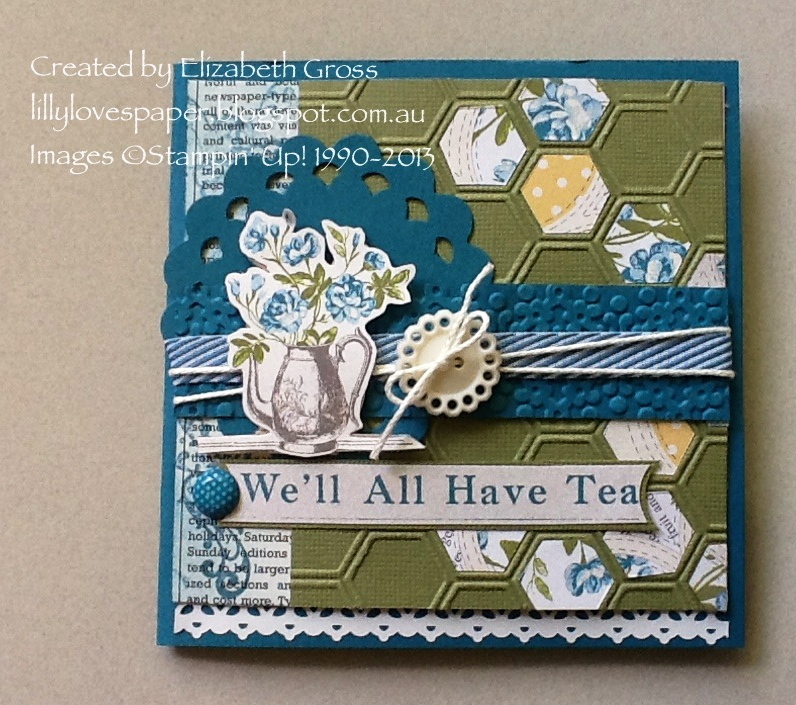 Used the new Timeless Talk stamp set, embossed this with Early Espresso powder and cut it out to layer up on my card. "I wish that I could be with you and share a cup of tea, but since I can't do that right now please have this one on Me", so you can include a teabag. I have used up lots of old bits and pieces and some new items- the Very vintage Designer Buttons are new, and so is the Island Indigo 3/4" Chevron Ribbon. But the ribbon was too wide for this project so I cut it in half and then sealed the edges with a flame. Tricky but successful! Existing items include the Perfect Pennant Bigz L Die, the Honeycomb Embossing Folder, The Delicate Designs EF, and the Adhesive Lace Tape. The retired items include the polka dot In colour Brads, and the Tea for Two DSP. The good news is that the we can still get the same design DSP but in a new Colour Palette - it's called Afternoon Picnic. The beautiful image of the roses in the teapot is now available too in a new stamp set called TEA PARTY - I may just have to get that one! You can purchase all of these great products anytime from my online store. The new "Best of Flowers" Set features the gorgeous Hydrangea stamp though it is a smaller scale than the original. I have had some fun stamping with it. In this card I coloured directly onto the stamp with Soft Sky ink, than added a few highlights using the Wisteria Wonder Stampin' Write marker, and the Gumball Green marker for the leaves. Once stamped I softened the image with the Blender Pen and added a little more Wisteria colour also using the blender pen. The cardstock layers were cut using the Windows Framelits in Soft Sky and Very Vanilla, then I trimmed them down for a more rectangular shape, the green mat is Gumball Green. The Base layer is made using the Beautifully Baroque Embossing Folder which I inked up with the Soft Sky ink pad before running through the Big Shot - I think this could be a new favourite colour for me! ( this technique is already a fave) The card is finished with Soft Sky Seam binding and one of the new Very Vintage Designer buttons and Some Linen Thread. I really love the rich texture of the embossing folder with the ink and hope you will give it a try. You can purchase all of these great products any time using the Shop Now button on this web page, or email me for any questions you may have.